Vegetable Quinoa Egg Bites are one of my favorite fast and healthy recipes for breakfast. Make them the night before then pop them in the microwave or toast them in the oven in the morning for a nutritious breakfast on the go. Throw a few in a plastic bag and you’ll have a yummy post morning workout snack on the way to work. Merry Brandybuck and Hungry Athletes alike might also enjoy this as a second breakfast. 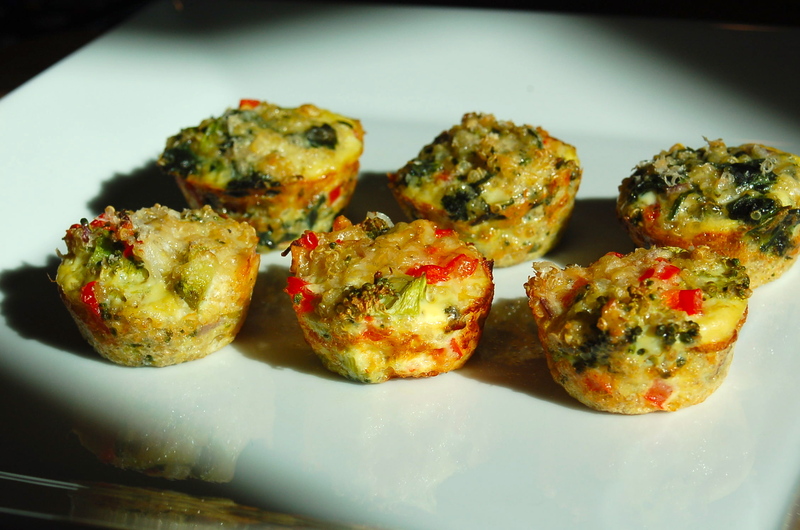 Resembling a mini quiche, they can be filled with your favorite vegetables. I like to fill mine with a combination of either spinach and red peppers or broccoli and red peppers. Cayenne pepper and nutmeg adds a nice flavor but be careful, a little of both goes a long way. I also recommend using freshly grated nutmeg. Nutmeg seeds last up to four years longer than powdered nutmeg. Cook quinoa according to the package instructions. Make sure you rinse the quinoa thoroughly if the package indicates it has not been previously rinsed. Rinsing will remove the quinoa’s natural coating called saponin, which can have a bitter or soapy flavor. Whisk together the eggs, salt, cayenne pepper and nutmeg. 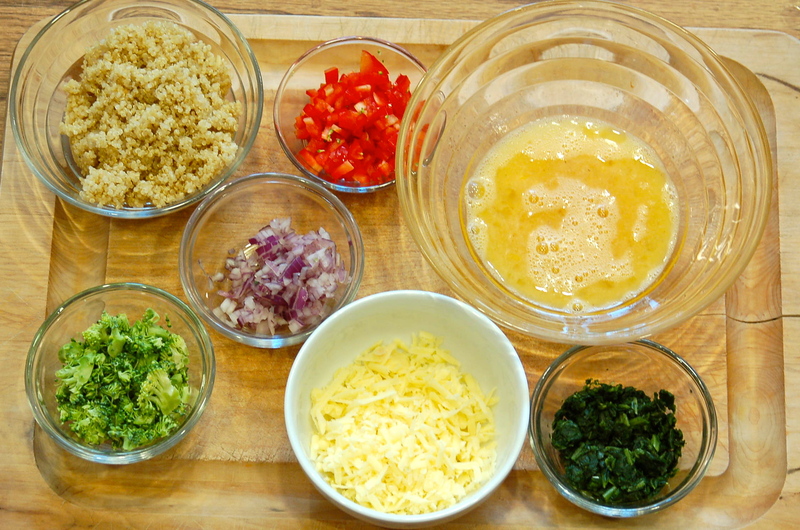 Then mix in the quinoa, vegetables and cheddar cheese. Brush the inside and top of a mini muffin pan liberally with oil. 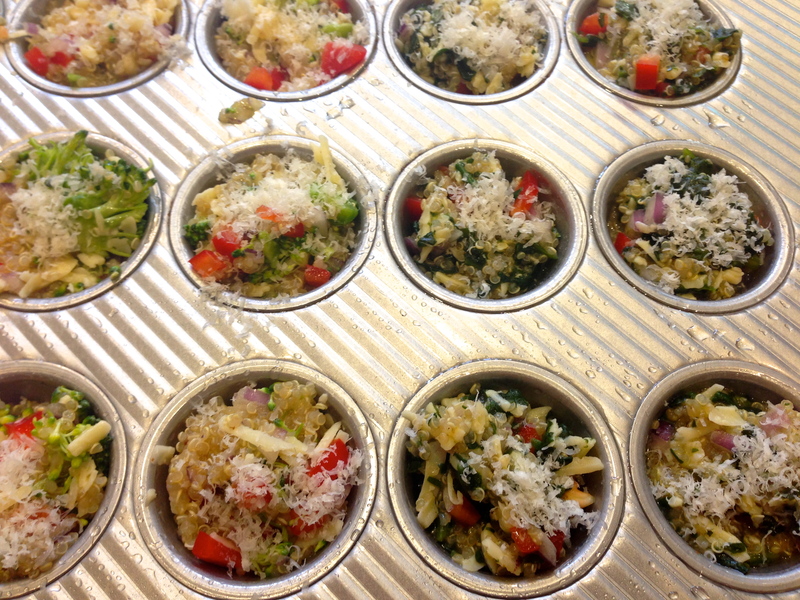 Fill the muffin pan all the way to the top will the quinoa and egg mixture. Sprinkle with finely grated Parmesan cheese. Bake for 25 minutes or until the edges are golden brown. These look great for my husband before a long bike ride or run. His biggest challenge is getting enough good food to last a few hours. Thanks! Thanks! Let me know how they turn out for you! I prefer real food over protein shakes and hope your husband enjoys them. Got one more recipe to add on to my breakfast list, yummzz! !